Athlos Academy of Jefferson Parish intends to serve approximately 900 K-6 students in its first year (2018-19). Athlos Academy of Jefferson Parish offers a unique approach that empowers students to live fulfilling, responsible, and successful lives by building on our three foundational pillars: Prepared Mind, Healthy Body, and Performance Character. Athlos students develop critical thinking and problem-solving skills as well as a broad knowledge base and healthy lifestyle habits. Our school culture celebrates high academic achievement, fosters individual growth in fitness and Performance Character, and promotes regular family engagement. The vision of Athlos Academy of Jefferson Parish is to produce students who are well-prepared to face life’s challenges and who have developed critical thinking and problem-solving skills as well as a broad knowledge base and healthy lifestyle habits. The school’s culture celebrates high academic achievement, fosters individual growth in athleticism and Performance Character, and promotes regular family engagement. The mission of Athlos Academy of Jefferson Parish is to provide high-quality educational opportunities for the whole child built on the three foundational pillars of Prepared Mind, Healthy Body, and Performance Character. 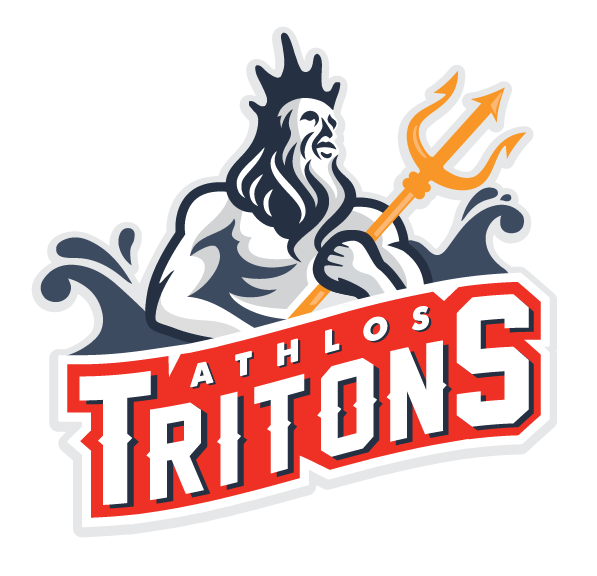 We're excited to introduce our mascot, the Athlos Tritons! The Athlos Tritons mascot was chosen by the founding board of Athlos Academy of Jefferson Parish. The Triton name was chosen in part because of its association with Greek mythology (just like the name 'Athlos') as well as the school's proximity to the ocean. Triton, a messenger of the sea, was the son of Poseidon and Amphitrite. Like his father, Triton was a mighty and fierce sea warrior that possessed powerful control of the ocean. Triton has been known for having athletic abilities and can be seen with a 3-prong spear called a trident.